It’s Friday and I’d love to start this text with good or funny news. But, to paraphrase a poet, there was a Rio de Janeiro in the middle of the path, in the middle of the path there was a Rio de Janeiro. There, after the floods that hit the city, two unlicensed buildings collapsed this morning. Two people died in yet another tragedy. Back to scandalous mode, contractor Marcelo Odebrecht revealed that Justice Dias Toffoli had an alias in his company corruption scheme: the friend of my father’s friend.” Odebrecht recalls Lula, who reminds him of PT, which reminds him of Dilma, who reminds him of… Bolsonaro. Yes, the current president is acting exactly like his predecessor, fixing diesel prices for fear of another truck drivers’ strike. Oh, and if you ever intended to send Bolsonaro a letter, don’t you dare use “Your Honor” anymore. He signed a decree ordering to be addressed just as “Mister.” After comedian Danilo Gentili, now it is comedian Gregório Duvivier’s turn to face the threat of a lawsuit because of offensive words against Minister Sergio Moro and His Excellency, I mean, Mister President Jair Bolsonaro. Rio de Janeiro has already seen better days. For the city, 2019 has been a succession of tragedies and disasters, both natural and human. 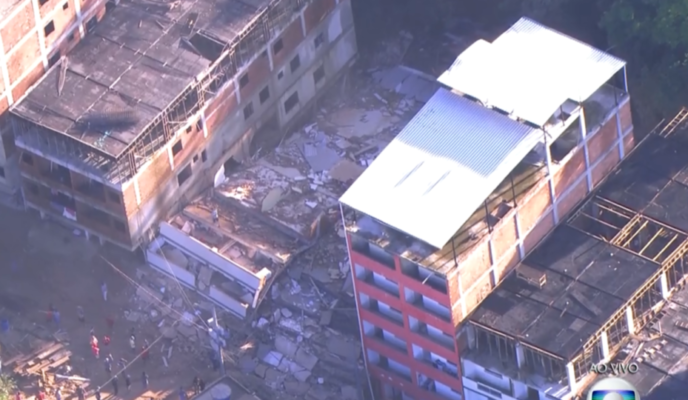 After the storm that hit the city earlier this week, two buildings collapsed in a poor community in the western neighborhood of Jacarepaguá today. The constructions were irregularly built, presumably by organized crime. Two people died and seven got injured. There are still two people missing. In a document Marcelo Odebrecht delivered to the Federal Police task force responsible for Operation Car Wash this week, several names of people involved in a massive corruption scheme have been revealed. One of them is the Supreme Federal Court President, Justice Dias Toffoli, who appears in the document under the curious alias “the friend of my father’s friend.” Odebrecht, however, didn’t formally accuse Justice Toffoli of corruption. In a controversial measure, President Jair Bolsonaro has emulated former president Dilma Rousseff today and has ordered Petrobras to reduce diesel prices. It goes against his much-vaunted stance as a liberal on economic issues. An interventionist price policy such as that was responsible for the Petrobras fallout a couple of years ago. Bolsonaro has made the decision supposedly fearing another massive and potentially harmful truck drivers’ strike. President Jair Bolsonaro has some weird priorities. In a surreal decree signed yesterday, he has prohibited all federal public servants from using pronouns of address such as “Your Excellency” and “Doctor” (in Portuguese a pronoun more akin to “Sir”) in official documents. They are to be replaced by simpler forms of address, such as “Mister”. Pronouns even more elaborate, such as “Your Worship” and “Most Honorable,” are also forbidden from now on. These are dark times for freedom of speech in Brazil. Soon after right-wing comedian Danilo Gentile had been sentenced to jail because of a bad joke involving left-wing federal representative Maria do Rosário, a Prosecutor from Curitiba has decided to file a lawsuit against left-wing comedian Gregório Duvivier for having offended Minister Sergio Moro and President Jair Bolsonaro. As the Prosecutor himself has no jurisdiction over the matter, the lawsuit is likely to have no effect other than sending an ominous message.